Guna your approach is quite unique and not confusing at all. Thanks for your help! With your guidance I was able to get a life insurance protection plan that fits my needs and budget. I am now in a much better position to plan the rest of my finances. After connecting with you, I am much more educated and aware of the various life insurance, investment products and income tax saving strategies. Guna is a very knowledgeable and professional individual. You can always count on his good advice and help. 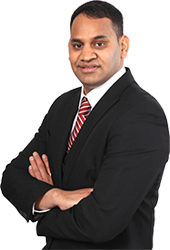 He works with your personal needs and offers the appropriate solution. He is not aggressive in his selling technique but rather client accommodating. He is very pleasant to work with. I would absolutely recommend him to my friends and family. He is well suited for what he is doing and does it with a positive outlook and it shows. Guna is a very amicable yet a highly professional person. He is available to meet in a reasonable notice on my convenience. For busy professionals like me it was a pleasant surprise to see such a flexible person. Guna is one of those individuals who care for the wellbeing of the clients. He always put the client first and tries to get the best product to suite each individual. Thank you Guna for patiently explaining me about finding the right protection plan for my family within my budget. Thank you so much and God bless you. I am thankful to god that I met you Guna 5 years ago. This year (2014), when I decided to buy a home, I reviewed my RRSP investments with Guna, I was thrilled to see the growth of my portfolio, and this helped me to use up to $25,000 from my portfolio as down payment on my first time home. Not only this, for a young person like me, I am glad that with your advice I was able to get a big guaranteed pay life insurance coverage 5 years ago with nearly one third of the cost I would pay now. Thank you Guna.